Product prices and availability are accurate as of 2018-10-15 19:40:05 UTC and are subject to change. Any price and availability information displayed on http://www.amazon.com/ at the time of purchase will apply to the purchase of this product. Expand your culinary inspiration with the versatile Tramontina Limited Editions Series 1200 Enameled Cast Iron 5.5 qt. Covered Round Dutch Oven. This stylish Dutch oven is made of enameled cast iron in white for a look that brightens up any table or countertop. It provides even heat distribution in the oven and can also be used for pre-chilling food such as fruits, veggies, or pasta in the refrigerator. 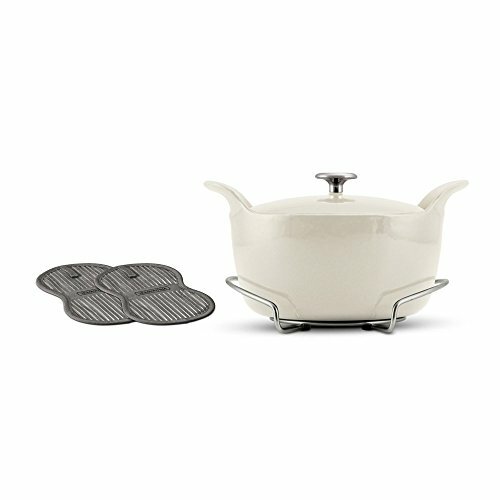 Go from oven to table with the included two pot holders and stainless steel trivet. It also features an oven-safe lid, self-basting ridges, and integrated handles for easy transport. Made of enameled cast iron. Oven-safe stainless steel lid. Self-basting ridges. Colored enamel adds style. Included trivet for oven to table service. Comes with 2 pot holders. Oven-safe up to 450 degrees F.